GPRS, LLC. of Colorado was contacted by Eagle County Contractors to locate post tension cables and other anomalies in a cast in place concrete slab in Vail, CO. The customer was looking to penetrate the slab with core drilling to install plumbing for a bathroom in a tenant finish project. The customer did not wish to strike post tension cables in the slab, causing costly and unwanted repairs as well as safety hazards. Ground Penetrating Radar Systems, LLC. arrived on site to provide concrete imaging services in a quick and cost effective manner to keep the job safe and on schedule. GPR technology is a newer alternative to traditional concrete x-ray with a lot of exciting benefits to improve cost efficiency and overall the time needed to see what is inside the concrete slab you’re trying to core drill or saw cut. Ground Penetrating Radar emits no radiation so is completely safe to be around, not having to work after hours or clear rooms of other employees on site. GPR only requires one side of the concrete slab or wall to scan, further saving time with the process. 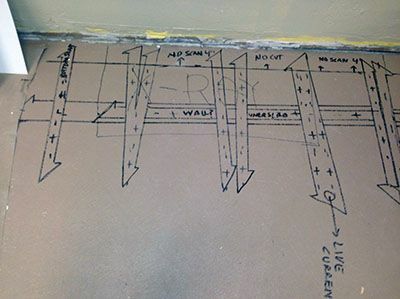 Also now allowing the option to scan slab on grade concrete; know what is under and in your slab instead of wondering if you’ll strike something, causing expensive repairs and delaying your project, or even injuring workers. All data findings are marked directly on the surface in real time, unlike traditional concrete x-ray which needs additional time to develop films or process data. All of these benefits in the long run save you time and ultimately money on your project. Ground Penetrating Radar is the new way to x-ray! If you are interested in learning more about our concrete imaging capabilities or other Ground Penetrating Radar applications such as locating Utilities and sub-surface anomalies along a proposed pipeline trench, locating Underground Storage Tanks (USTs), clearing boring locations of possible Utilities for soil samples, Void Detection or even structural investigations. Don’t hesitate to contact us for a demo or lunch and learn – let us buy your team lunch so we can tell you more about our company and what we can offer your company and projects. Ground Penetrating Radar Systems has an office local in Denver, CO serving all of Colorado and Wyoming, as well as offices in nearly every major city in the United States. Contact Ryan Shannon (Project Manager) at (303) 913-8630 or ryan.shannon@gprsinc.com today to schedule an appointment or with any inquiries.